The numbers say you should expand your services. But, where to make that investment isn't always obvious. Raise your hand if you thought Amazon would succeed when they expanded beyond selling books online over 20 years ago. Although few predicted success, their customer-focused platform and strategic addition of practical products and services catapulted them into the world’s leading retailer. And although your business may never resemble Amazon’s, the numbers say you, too, should expand your services. What is the most compelling reason to expand your business? Research from various organizations finds strategic expansions improve top line sales, increase profits and provide better business health. As for services, participants in the Idealliance “State of the Industry Report, 15th Edition” expect, on average, something other than printing, both traditional and digital services to provide 31.6% of their revenue in 2018, up from just 13.3% in 2012. That means many commercial printers are pursuing opportunities to get involved in their clients’ work earlier, stay involved longer and satisfy a broader range of their communication needs - print or otherwise. Furthermore, in their book, What’s Your Digital Business Model, Peter Weill and Stephanie Woerner found that enterprises ranking in the top third of digital experience had an 8.5% higher profit margin and 7.8% higher revenue growth than their competitors. But that’s not all, by expanding your platform you can grow your customer base and increase diversification. Both minimize your business risk. Plus, it has proven to help organizations better adapt to changes in the market and to consumer demand which increases long-term business success. In a presentation to the Great Lakes Graphic Association, James Martin, SGIA Executive Vice President, detailed how convergence is occurring with virtually all segments of the industry. NAPCO Research evaluated the degree that printers are expanding their offering across six different industry segments. 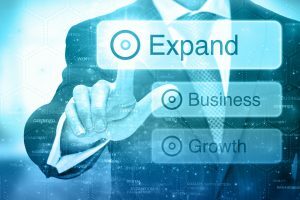 They found that the vast majority of organizations, 95% of those surveyed, believe there’s an expansion opportunity within their own business.
. . . are the most likely areas for expansion to occur in the upcoming year. There are numerous options but, expanding your capabilities to provide a service that current customers use and are willing to buy from you is a low-risk opportunity. And, outsourcing that capability until it is cost beneficial for you to build out, further lowers the risk. But, when looking for expansion opportunities beyond the low hanging fruit, keep these points in mind. The SGIA convergence study provides clear evidence that organizations specializing in a different product category may now compete against you. And, it’s not just companies in the print industry. For example, customer relationship management (CRM) and marketing automation companies provide a robust digital services offering. But, many now also provide direct mail and kitting and fulfillment options that integrate into their electronic communication platform. In the CRM and marketing automation example, the critical customer need is delivering effective communications to the customers’ target audience. CRM and marketing automation organizations built their business centering on a digital platform that provides numerous functions including effective digital communication options. Initially, print wasn’t an alternative. But, when it became apparent that integrating print into the process helped them deliver effective communications, they built an API and partnered with print providers to satisfy that need. The fact is, these organizations provide effective marketing services. But, they are no more effective than the marketing services successful commercial printers provided their customers for years. So, adding a complementary digital service offering is sound strategy. Start - consistently make small bets that address customer needs. This strategy creates value for current customers which can further elevate your relationships. Plus, it allows you to learn, hone your offering and determine if it’s viable to sell to a larger audience. Partner - develop relationships in segments that expand your knowledge and your overall value chain. Move up - better understand the end customer. If you are P&G you may sell to Walmart but your end customer is the consumer who shops there. If you sell print, direct mail, catalogs, books, kits and more, they are distributed by your direct customer to an end consumer. In both cases, the better you understand the needs of that end customer, the more value you can offer your direct customer through product innovations and more. Lastly, if you have arrived at a new offering, worked through the financials and justified the expansion based on a certain baseline of business, then the incremental business you sell into that platform is extremely profitable. So, invest the appropriate amount of time and effort on marketing your capabilities. Growing revenue through a new product offering is no guarantee. But, given the ongoing market changes, it’s likely that doing nothing is a guarantee. A guarantee that you’ll face the ongoing threat of declining business. 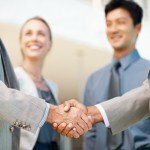 Are you looking to expand your services? InterEdge Marketing works with organizations to analyze the market opportunities that best leverage your business strengths to identify new products and services that will grow your business. In addition, we specialize in developing and deploying effective marketing programs that will maximize the return on your investment. Contact us for more information.